Seniors welcome to our RV Resort located on an Indian reservation - No tax! 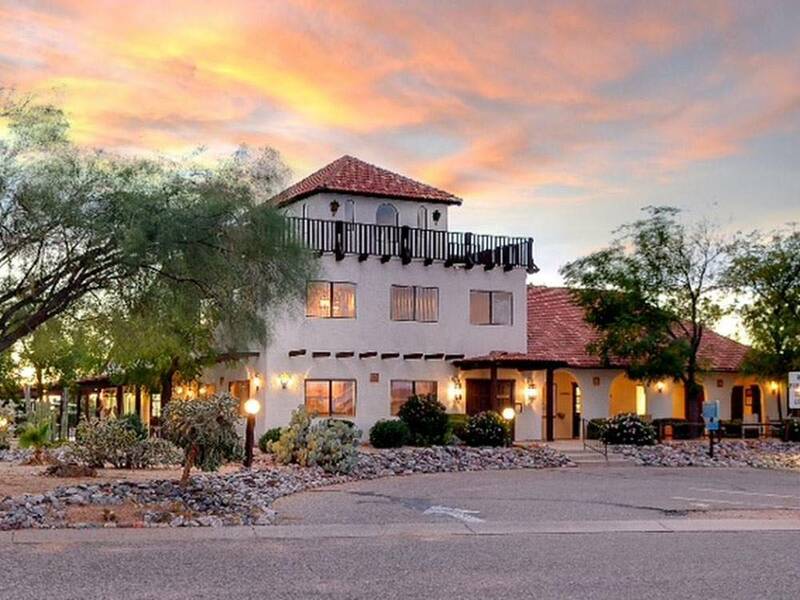 Enjoy our mission style clubhouse and all of the resorts amenities: indoor pool, spa, billiards & activities. Close to 4 casinos, golf & downtown. The park is well maintained, but does need a face lift. The sites are quite large, level, has a concrete patio pad, and all connections worked well. It is not in a good neighborhood, but the park felt very safe, The people were friendly and it was dog friendly as well. Overall this was a good deal for the price, but not a 10/9/10 as rated. We did notice the airplane noise another reviewer mentioned. Only a couple of times was the noise very loud late at night. The noise did not affect our sleep or enjoyment of the Park. The lots are wider than many we have used. The WIFI is OK, works most of the time, a little slow, not terrible. Lots are level, the gravel is smooth, not rough rocks. The swimming pool is indoors, the water is warm. We attended a sloppy joe dinner one evening. Many people attending the dinner are at this Park for the winter months. We stayed two weeks. This Park is not inexpensive nor costly, that said Mission View RV PArk has nicer aminaties than many less costly parks. WiFi just the worst then any place we have stayed. I was disconnected three times just trying to get to this page. Manager keeps saying they are getting est. to up grade. They have been saying this since Nov. 2016. Pool OK but was closed for a week for maintenance never saw anyone working on it. The rating for this park is way to high. We enjoyed the park. Very nice staff. We chose it because of the indoor heated pool and hot tub. We used it a lot. It was not a new place but the pool area was enjoyable. We were disappointed in the showers. Just old. Wi Fi was slow during high times. Great Verizon. No cable but good OTA and satellite. It is a few blocks from an Indian casino. The park is on a Reservation and does not have to collect sales and Stadium taxes. Do not miss the Mission down the road. They have fantastic Navaho Tacos in front about lunch time. Check out the Bread and Butter Cafe. Wifi very slow to non-existent. No security, the personal at the gate are for information only. Washrooms clean but outdated and some doors don't lock. The club house ceiling has water damage and the doors don't seal out the cold, drafty. Activities are good to very good. Located in high crime area. No security gate. No perimeter security. Noise from near by apartments. Charge for wifi. Stray animals everywhere. Look elsewhere, as there are more in area that have more security. From Jct of I-10 & I-19 (Exit 260), S 8.5 mi on I-19 to San Xavier Loop Rd (Exit 92), E 1.4 mi on San Xavier Loop Rd (L).